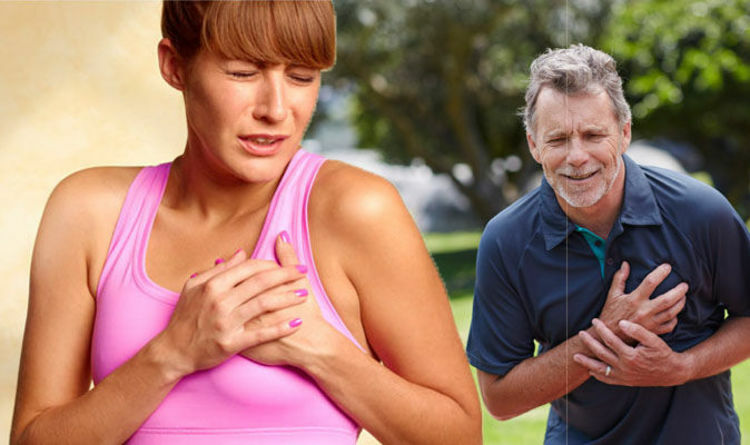 A heart attack happens when there is a sudden loss of blood flow to the heart. This can happen due to a blood clot, and should be treated as a medical emergency. Coronary heart disease is the leading cause of heart attacks – a condition in which the coronary arteries get clogged up with deposits of cholesterol. Before a heart attack, one of the deposits ruptures, causing a blood clot to develop, triggering a heart attack. If you suspect a heart attack, an ambulance must be called immediately. It’s therefore important to recognise the symptoms. The most common sign of a heart attack is pain or discomfort in the chest that suddenly occurs and doesn’t go away. The pain may spread to the arms, neck, jaw, back or stomach. The pain may be severe, but can also just feel uncomfortable. Patients may also feel sick, sweaty, light-headed or short of breath. Some people may not realise the pain they are feeling in their chest is the start of a heart attack, as it is not necessarily severe. In some people, the feeling can be confused with indigestion. “It’s possible to have a heart attack without experiencing ‘classic’ chest pain,” said the British Heart Foundation. The NHS adds elderly people, women and those with diabetes may not feel any chest pain at all. In the event of a heart attack, while waiting for the ambulance to arrive the affected person should sit and rest. If aspirin is available, chew one 300mg tablet. If aspirin is not to hand, don’t get up and look for one, unless someone can do this for you, as this may put unnecessary strain on the heart. The British Heart Foundation advises people between the ages of 40 and 74 to get a heart health check. This can assess the risk of having a heart attack in the next 10 years. Identifying and managing conditions such as high blood pressure and high cholesterol could help lower the risk of having a heart attack in the future. “A heart attack is life-threatening. If you think you or anyone else is having a heart attack, call 999 for an ambulance immediately,” said the British Heart Foundation. “Don’t worry if you have doubts. Paramedics would rather be called out to find an honest mistake has been made than be too late to save a person’s life,” said the NHS.